The nights are drawing in, so I felt like making something with a real autumn flavour.And, what could be more seasonal than golden, roasted root vegetables? 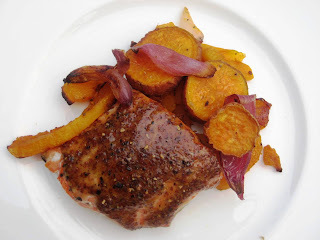 This is a very easy one-pan salmon supper that will cheer you up on a grey day. Mix the mustard and honey together in a small bowl then spoon onto the top of your salmon fillets and leave to marinade whilst you get the potatoes roasting. Slice the onion into rough quarters. Chop you sweet potatoes (skin on) into rough cubes (about the size of your thumb). Put in a roasting tin and add olive oil. Stir around until all covered and then pop in the oven at 180c for 25-30mins. When your potatoes and onion are looking nicely roasted, take out of the oven and add your salmon fillets to the tin. Pop back in the oven for about 7-10mins (depending on the thickness of your salmon fillets).